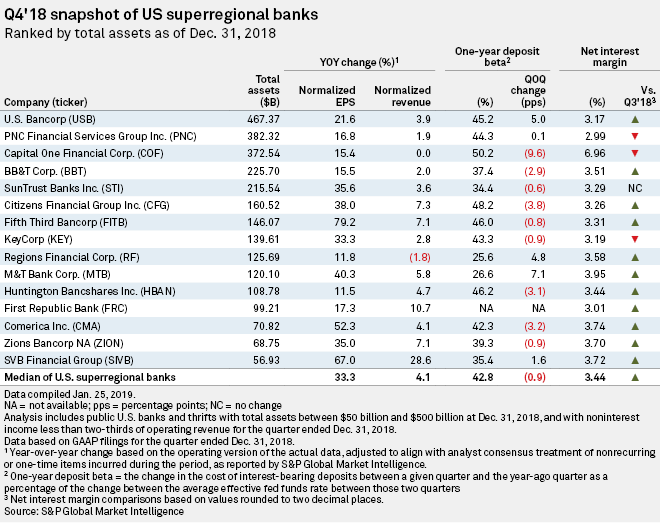 U.S. superregionals — select banks with $50 billion to $500 billion in assets — reported continued growth in normalized EPS and revenue as deposit betas declined modestly in the fourth quarter of 2018. The group's median normalized EPS growth was 33.3% year over year, while normalized revenue grew at a slower rate of 4.1%. Cincinnati-based Fifth Third Bancorp posted the highest EPS growth of the group at 79.2%, while Santa Clara, Calif.-based SVB Financial Group logged the highest normalized revenue growth at 28.6%. 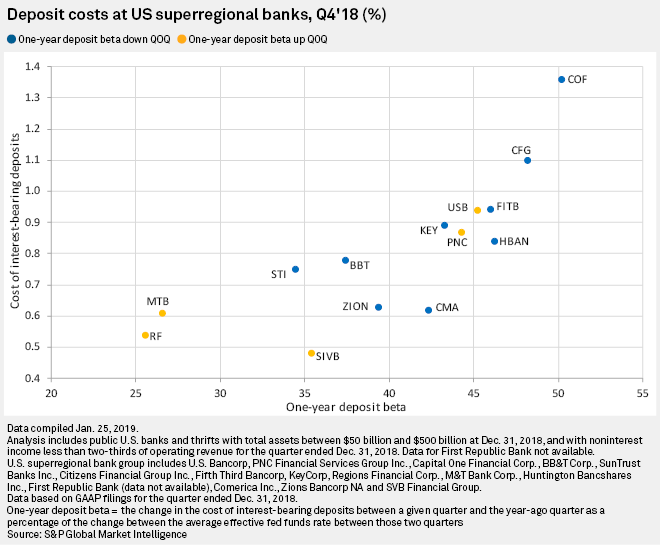 Deposit costs continued to rise at superregional banks in the fourth quarter, but at a slightly slower pace. Deposit betas, or the percentage of changes in the effective federal funds rate that banks pass on to customers, declined modestly at most large regional banks compared to levels in the previous quarter. 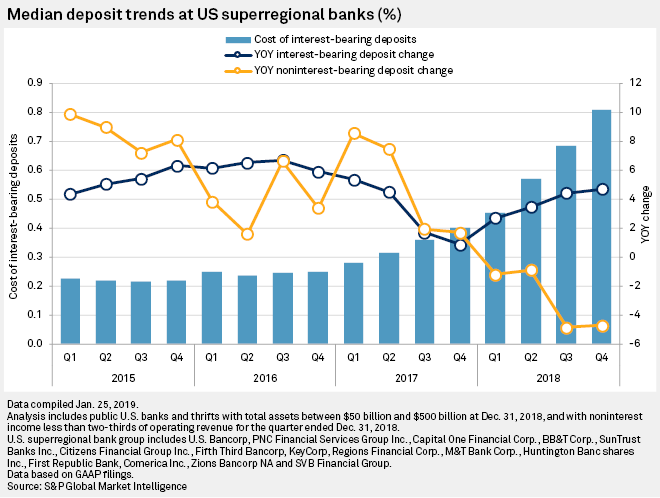 The median year-over-year deposit beta on interest-bearing deposits in the fourth quarter was 42.8%, down from 44.2% in the previous quarter and up from 19.5% in the year-ago period. Capital One Financial Corp. posted the highest deposit beta decline at 9.6 percentage points to 50.2%. The McLean, Va.-based company reported the highest deposit beta among the group, as well as the highest cost of interest-bearing deposits at 1.36%. Deposit betas of Birmingham, Ala.-based Regions Financial Corp. and Buffalo, N.Y.-based M&T Bank Corp. grew quarter over quarter, but remained relatively low at 25.6% and 26.6%, respectively. Minneapolis-based U.S. Bancorp's deposit beta grew 5 percentage points from the previous quarter to 45.2%. During its fourth-quarter earnings call, U.S. Bancorp Vice Chairman and CFO Terrance Dolan said deposit betas will stabilize for the most part once the Federal Reserve stops moving rates, "with the exception of the penny pressure you have from a competitive standpoint to fund loans." The median net interest margin among superregionals was up 4 basis points quarter over quarter to 3.44%. Dallas-based Comerica Inc.'s net interest margin grew 10 basis points to 3.74%. Chairman and CEO Ralph Babb said on his company's earnings call that deposit costs remained in line with management's expectations and that the company continues to focus on a "relationship approach" in managing deposit pricing to attract and retain customers, according to a transcript. Columbus, Ohio-based Huntington Bancshares Inc.'s net interest margin grew 9 basis points to 3.44%, while SVB Financial's net interest margin grew to 3.72%. Capital One CFO Richard Blackley said during the company's earnings call that increasing deposit costs will continue to put pressure on the bank's net interest margin. For the fourth quarter, the company's net interest margin fell 5 basis points from the previous quarter to 6.96%. Click here for a template that compares the market performance for a portfolio of companies. Click here to view a webinar on S&P Global Market Intelligence's Peer Analytics tool to learn how to run a custom peer analysis for covered public companies.